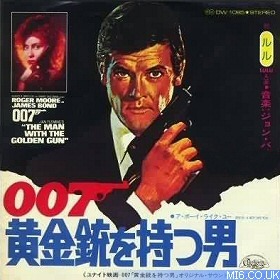 Main Theme: "The Man With The Golden Gun"
Above: UK cover art (the US version had a green background hue). 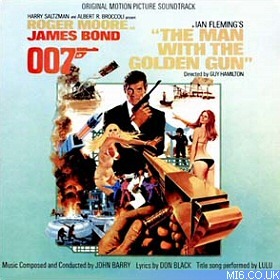 After a one-film break from the series following "On Her Majesty's Secret Service", regular composer John Barry returned to create his sixth James Bond soundtrack - "The Man With The Golden Gun". 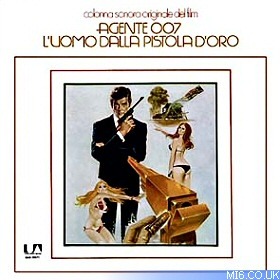 The film was the first in the series to drop the distinctive plucked guitar from the Bond theme heard over the Gun Barrel sequence - in all subsequent John Barry Bond scores, this theme would be heard on strings and trumpet. Not present on the album but heard in the film is a brief reprise, for recognition purposes, of the "Live And Let Die" theme when Sheriff J.W. Pepper from the previous film reappears. Above: Original artwork from the German (left) and Italian (right) 45rpm releases. The theme tune was performed by Lulu, composed by John Barry, and the lyrics to the song were written by Don Black. 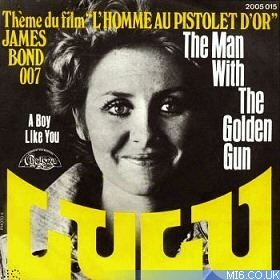 Alice Cooper claims his song "The Man With The Golden Gun" was to be used by the producers of the film until it was dropped for Lulu's song instead. Cooper's song appears on his album "Muscle of Love". 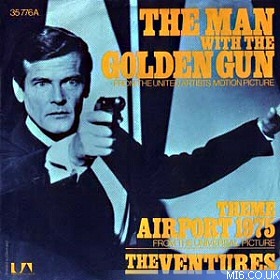 Barry considered the theme tune – the only Bond film title track not to chart as a single in either the UK or US – and score to be among the weakest of his contributions to the series: "It's the least interesting Bond song. It's the one I hate the most. It's the one thing I think was really... bad. It was bad." 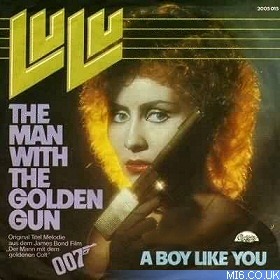 Certainly the title song is notable for having especially suggestive lyrics, and during a TV celebration for the 40th anniversary of the series, Lulu's performance was introduced with reference to its being the raunchiest of all Bond songs. Above: Artwork from the single vinyl release from The Netherlands (left) and Germany (right). Also for the first time, the song's end theme is not a straight reprise of the opener, as it begins with different lyrics (subsequent films followed suit with variations in arrangement, ahead of a new practice of using a different song altogether). The popular song "Mindfields" by The Prodigy (released on The Fat of the Land) features a specific part of 'Hip's Trip'. Barry gave the band permission to use it. Above: Artwork from the single vinyl release from France (left) and Japan (right).